I have a deep-seeded fear that the children's things will ultimately take over the house and I'll wind up on some Hoarders: Toys R' Us Special Feature. However, this summer that fear was taken over by pregnancy, and I would have rather been eaten alive by Little People than move from the couch. But now that the baby is 6 months old, I've decided its time to get things back on track. 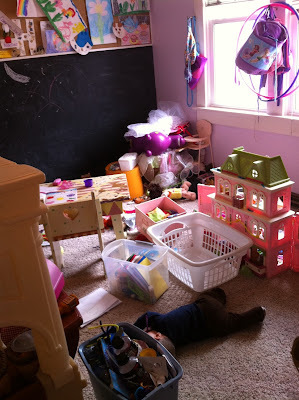 So, for the next few days, I will spend at least an hour a day cleaning and clearing out the toy room. Today it began, and after an hour, it still looked pretty bad. Take a look. And yes, that's the baby on the floor. I unearthed him from some doll house rubble.